I have had a lot of comments and questions from my followers as to how i have managed to loose my baby weight and get back into my pre-pregnancy jeans after just three months. I know a lot of mummies are in dispair of their figure after having a baby and any tips or advice are welcomed. So i wanted to share my thoughts on the matter and see if i could help all mummies to feel a little bit yummier, without much effort, really…. Now i was quite lucky that during my pregnancy i did not put on too much excess weight, and if i’m honest i think this is key to getting back to your pre pregnancy figure as soon as possible. Having done a lot of modelling i have always been conscious of my weight and tried to eat healthily wherever possible, i was also conscious that during my pregnancy i did not eat for two and i kept up regular exercise wherever possible, even if it was just walking the dog! This did prove rather difficult towards the end due to acute back pain but i did push on through, just waddling a little slower and for a shorter period of time. And walking i think is the key. Nothing too strenuous and something you can fit into your every day routine without any effort! It just requires motivation and planning! Walk to the shops instead of driving, even if the walk takes 40 minutes to an hour, i promise that it will be worth it, and if you think about it walking is actually a lot easier then loading and unloading the car! By the time you have got packed up you would already be half way there. I also walk a lot with the dog, i simply put Annabella in her baby Bjorn (which by the way is the best and easiest baby carrier out there. I’m sorry to say but i have tried a lot of slings and nothing compares for ease of use, longevity and practicality). They can be expensive but definitely worth the money. 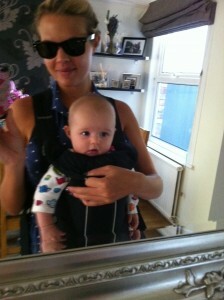 Walking is so easy with the Bjorn as you are completely hands free. It just clips on like a backpack so no fussing with positions. Great to wear around the house too if your baby is not settling but you need to get on with cooking the supper. So there you have it my top tip on loosing the baby weight without even knowing you are doing it. Brisk walking here there and everywhere! It is one of the best forms of cardio (the fat buster) and also quite enjoyable, especially if you are shopping at the time! Note thou that you need to walk at a reasonable speed for it to work properly and atleast 3 times a week i would say! I am lucky as it has been summer so i literally walk everywhere! I do also venture out in the rain too though with my rain cover and barbour, so no excuses girls. Ditto!! I love a lunge with Baby Bjorn! I also walk tons with the sling (and breastfeed) and now weigh less than I have in 4 years. Also, pushing a buggy on hills is amazing. People worry about baby weight, but it needn’t be that way. I love taking my little peanut out in the jogging stroller. Of course I don’t jog, I just walk, but we go a couple miles per day and it seems to be paying off. Is it just me or does eating healthier get a million times easier after they’re out!